Our visit to Alabama on Friday the 13th was neither unlucky nor scary. On the contrary, although Kathy and I experienced one small technical glitch resulting in the switching of an aircraft, we arrived in Mobile, Alabama only slightly delayed. District Governor Clyde Glen Elmore met us at the airport, drove us through the spring rain and fog to our hotel in Daphne, and provided us with the information we needed to begin a wonderful visit with Lions of District 34C. 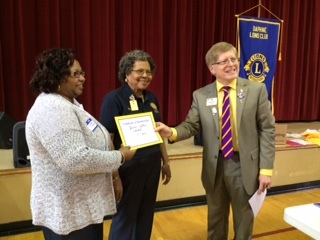 The evening began with the official chartering of the Daphne Lions Club. This special event was my first club installation as an International Director and it was memorable because not only were many members and officers of the new club in attendance; but also, the current and many Council Chairs, Past District Governors, and even a Past International Director, Yamandu Acosta and his wife, PDG Sylvia, added special distinction to the event. The fact that with the addition of this club, the district was at a +34 in net growth so far this year deserves mention and acclaim. I have no doubt that with the enthusiasm demonstrated by the district leaders in attendance, District 34C will surpass the 1250 mark by the end of the year. 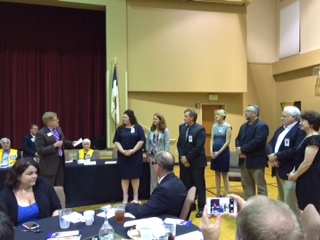 New members were received and officers installed. 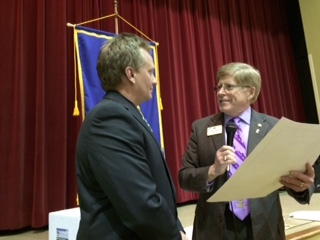 Daphne Lions Club President Kent Marcus receives charter from ID Robert Littlefield. I presented President Kent Marcus with the Charter document and the club received many gifts from other clubs and Lions present. PCC Ron Seybold gave unique and helpful gifts on behalf of the Global Membership Team to jumpstart the new clubs project account. For example, a gift certificate to send the Vision Van to a school for screening; and a gift certificate to send a child with diabetes to camp. What a fantastic idea to share with other clubs who want to help a new fledgling Lions Club. Watching these new Lion s receive their pins so enthusiastically demonstrates the healthy spirit of Lionism in Alabama. The rain stopped Friday night at the conclusion of the session; and Saturday morning was a gorgeous day in the delta. Kathy and I met many new friends at registration and even found a snowbird from Fergus Falls, Minnesota! 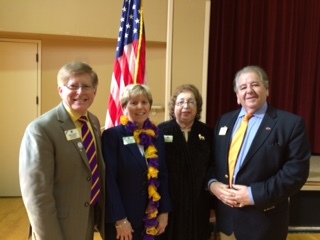 We also met an incredible Lion from the Gulf Shores Lions Club—Judy A. Wateley—who was reported as the very first woman member in Lions Clubs International. ID Robert Littlefield presents VIP President Wanda Scroggins with the President’s Certificate of Appreciation. 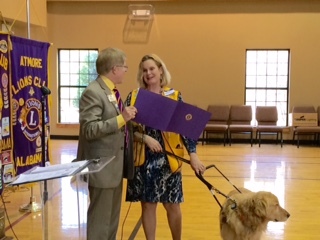 Another remarkable Lion, Wanda Scroggins, Club President and Organizer of a Lions Visually Impaired (VIP) Lions Club of Covington was present with other members of their club along with their guide dogs. She inspired all of us with her humor, warmth, and servant’s heart. A highlight my day was inducting and welcoming new Lion Johnetta C. Jackson, sponsored by Lion Mary Turner of the Eight Mile Club. There were many members of her club in attendance supporting their new Lion with laughter and wit. She will fit right in! 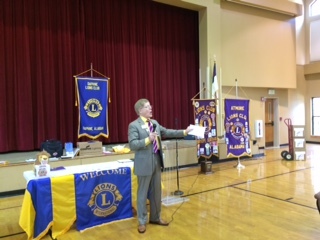 Speaking of wit, Lion Tom Williams, President of the Satsuma Lions Club entertained us several times with his Cajun-infused storytelling that implicated some of his relatives in hilarious antics that defied logic. Tom will keep any audience laughing non-stop—–and he “GAE-RON-TEEZE” it! ID Robert Littlefield and ID candidate Jerome Thompson discuss ideas to increase membership in Constitutional Area 1 and around the world. Another new friend we met in Daphne was Past Council Chair Jerome Thompson, a Lion from District 34A in Northern Alabama who was endorsed by his district to run for International Director this year in Honolulu. He is seeking Multiple District endorsement next month. PCC Jerome shared his passionate commitment as the state’s GMT Coordinator to increase membership and his efforts have paid off. He has a lot to offer by way of membership and club development. A real treat occurred when PID Yamandu Acosta introduced me to give my main speech after lunch. He had a little fun with me and, knowing that I enjoy singing and directing choirs, spontaneously challenged me to direct the assembled Lions and guests in a musical rendition of what turned out to be, “God Bless America.” The Alabama Lions sang out loud and clear and saved my reputation as a choral director . . . at least for another day or two. During the cabinet meeting, elections were held and three enthusiastic Lions were unanimously placed into office for 2015-2016: DGE Dora Rodriquez-Hartsock, Gulf Shores; 1st VDGE Daryl McDaniel, Dothan; and 2nd VDGE Claudia Wigglesworth, Daleville. In addition, four Lions received Presidential Certificates of Appreciation: Lion Daryl McDaniel; Lion Claudia Wigglesworth; Lion Wanda Scroggins; and Lion Tom Williams. 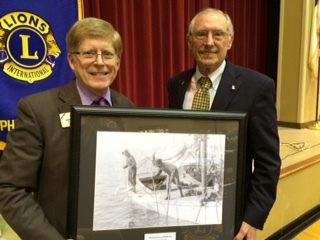 ID Robert receives a photograph of Oyster Fishermen from Immediate Past District Governor Ron Mitchell of the Saraland Lions Club. 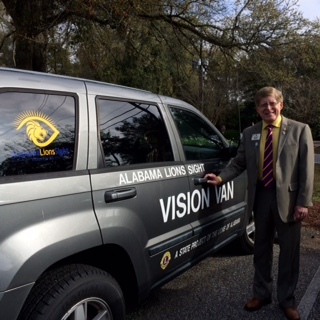 Alabama Lions proved to be most hospitable and generous with us as visiting representatives from Lions Clubs International; and for that, Kathy and I are most grateful. As we were leaving, we had many offers to return for a vacation or a visit. With the promotion by PCC Ron Steinmetz of the upcoming unveiling of the marble statue of Annie Sullivan and Helen Keller at Ivy Green on June 6, commissioned to celebrate the 90th anniversary of Helen Keller’s call for Lions to be “Knights of the Blind” in 1925,—if schedules allow, we just might have to try to return sooner than later! Our return flight was uneventful, and we returned to Fargo with good memories of another group of Lions we now can call friends. 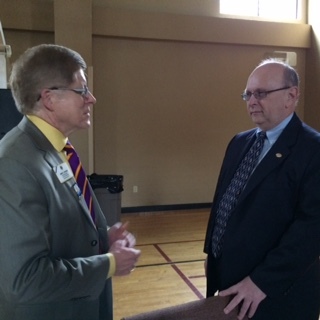 This upcoming week, we are at an in-district meeting in Minot where Multiple District 5 will elect its next Council Chair and select a new Vice District Governor Trainer who will succeed a great Lion, PCC Leo Grossman, who is completing his second three-year term this spring. 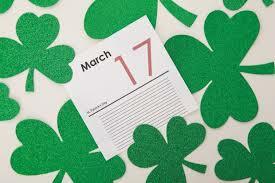 We (Kathy especially) hope everyone had a Happy St. Patrick’s Day and that the “Luck ‘o the Irish!” is with you throughout the coming year. I especially want to thank Kathy who helped write our message this week.